If it’s a Minority Report computing interface you desire, Flutter 0.5 (Mac App Store link) might get you one step further. The app aims to let you control your music and Keynote slides with hand gestures and your FaceTime camera, with ambitious long-term goals for scrolling, swiping between screens, and more. On one hand, this app is exceedingly cool: You feel a bit like a superhero holding up your hand to pause music, and Flutter’s gesture detection works very well. 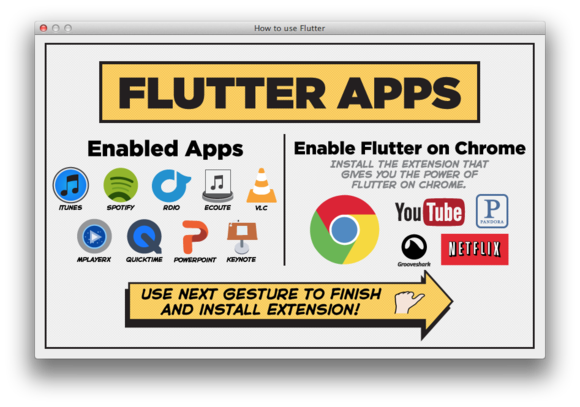 On the other, you have to run your webcam whenever you want to make a Flutter gesture. Even though the company states that no photo or video is being recorded—and you have to opt-in to send anonymous data—it still feels a wee bit creepy. That said, there’s a very easy toggle to disable the camera whenever you’re not actively making a gesture, which I appreciate. I can also see this being fantastic for casual parties—no need to tap on a screen when you can just wave at your computer to go to the next song. I’m looking forward to what Flutter has in store in the next year. Ditch the mouse and keyboard and control iTunes using hand gestures.